Autumn in our home is grabbing a quilt, a cup of warm apple cider, and stack of books to read on the porch during a crisp autumn morning. 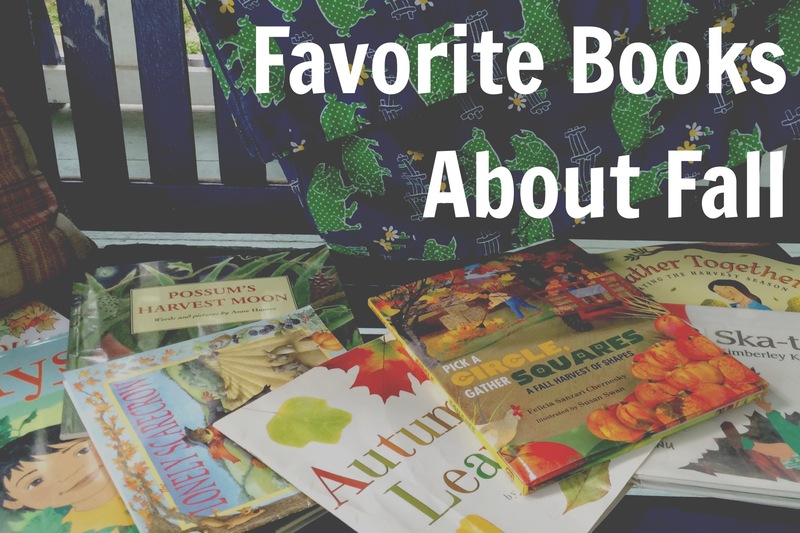 Inspired by the season, below is a list of favorite children’s books about fall to share with you and yours throughout this festive time of year. There are a handful of lesser known titles on this list as well as some tried and true, familiar, fall-time stories you and yours will want to read again and again and again. At the bottom of the list are books especially fun for babies and toddlers to read (although big kids will enjoy them too!). If you have a favorite title that isn’t on this list, please share in the comments below! 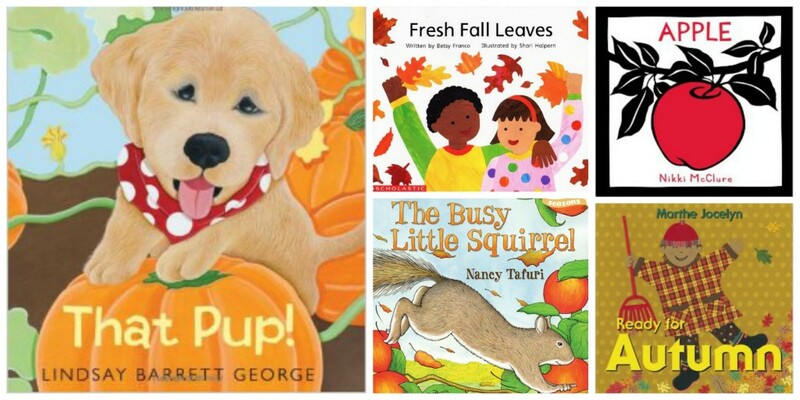 Books that include a variety of the season’s famous characteristics from leaves falling, to harvest season, to animals preparing for winter. Books about the autumn equinox (the official calendar start of the autumn season), the history of harvest celebrations, and stories inspired by the full moon in September and October known as “The Harvest Moon”. Books all about harvesting the seasons’ bounty before the cold winter months. Watch them turn, watch them fall! The changing of the leaves is an opportunity for play, art, inquiry, and fun. Scarerows used to… well… scare me. But I’ve become fond of them as an adult. These picture books are a lot of the reason why I now enjoy them. Apple picking, apple cider, apple pie… Mmmm. Books all about this favorite fall-time fruit. Pumpkin books that focus on the life cycle of a pumpkin and pumpkins in autumn. A few mention Halloween, but halloween pumpkins books warrant a whole other list in my opinion. Here are a few pumpkin (and one squash) themed autumnal books. Autumn is also a time of transition for the animal kingdom. Does your favorite animal hibernate, migrate, or adapt in winter? From busy squirrels to sleepy bears, these books will reveal the nature of animals in autumn. 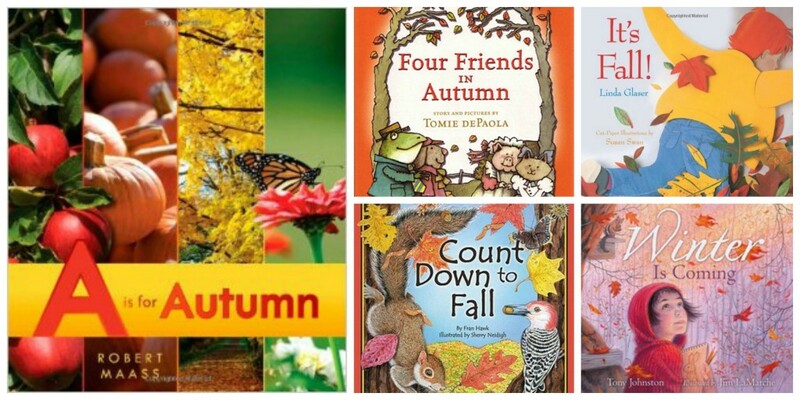 Books about all the autumn themes mentioned above in a format that the itty bittys will enjoy. These fall selections are great for ages 0-2. This is sooo cute! I’m gonna try it next week— I think I will use it with “Compost Stew” by Mary McKenna Siddas! I know the kiddies love to see what kind of stew it is— and it’s super gross! Thanks for the idea! Yay– Have fun!! Would love to know how it goes! I’m a music therapist with a major passion for emphasizing literacy in my sessions. Do any of these books from your AMAZING list have rhyme scheme, sound effects, a familiar melody, or onomatopoeia? Typically those are the types of books I would use in my music therapy sessions. Since most of your book selections are unfamiliar to me, I was hoping you could give me some pointers! Thanks!